Keyword research is one of the pillars of both natural and paid search campaigns. By following the keyword choices used by consumers in the search engines, websites can focus on those terms to capture traffic. This tenet of online marketing and search engine optimization is fairly well established, but the tools used in keyword research are ever changing. There have been, to date, two prominent tools for keyword research: Wordtracker and Keyword Discovery. Both of these have free versions that offer good, basic information, and both also have paid versions that offer much more functionality and insight. The shortcoming of these (and most other) keyword tools is that their numbers are somewhat theoretical. Their search-traffic analytics do not represent actual search numbers from either Google or Bing, but rather an amalgamation of data from multiple, secondary search entities. Google’s AdWords Keyword Tool table. 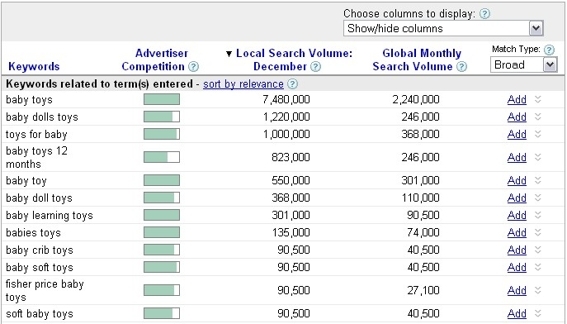 Once a keyword or phrase is entered into this tool, a table appears (see image above) with three key sections: Advertiser Competition, Local Search Volume, and Global Search Volume. Says Google of the search volume numbers, “If you use the standalone or external Keyword Tools, your country and language selections will influence [the Local Search] column. The Global Monthly Search Volume column always shows traffic in all countries and all languages.” Thus, the local-search numbers are really not all that local. They most likely represent your country, which can be useful. Global Monthly Search Volume represents searches worldwide. Advertiser Competition shows how competitive the particular term is in AdWords, but this, too, can be used as a general guide for natural search optimization. Within the professional SEO community, the Google AdWords Keyword Tool is one that is being utilized more often, simply because the numbers are less theoretical and more representative of actual Google search traffic. Many ecommerce companies implementing paid search campaigns may already be using the tool. But the information can – and should – be used for natural search campaigns, as well. If the Google AdWords Keyword Tool is new to you, consider adding it for both your natural and paid search campaigns. You’ll be applying some of the most concrete Google search numbers available, and that’s good stuff.